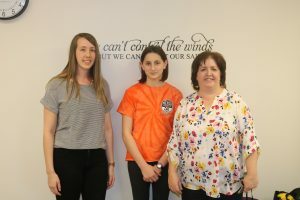 MEXICO — A seventh grader from Mexico Middle School will embark on a journey of a lifetime this summer as Julianna Ricker has been accepted to an exclusive camp in Canada aimed at fighting ocean plastic pollution. Mexico seventh grader Julianna Ricker, center, will go to Vancouver this summer for a summer camp where she will learn about fighting ocean pollution. Ricker is pictured along with two MACS teachers who helped inspire her to go on the journey. From the left is Brittany Malone, Ricker and Alicia Archer.